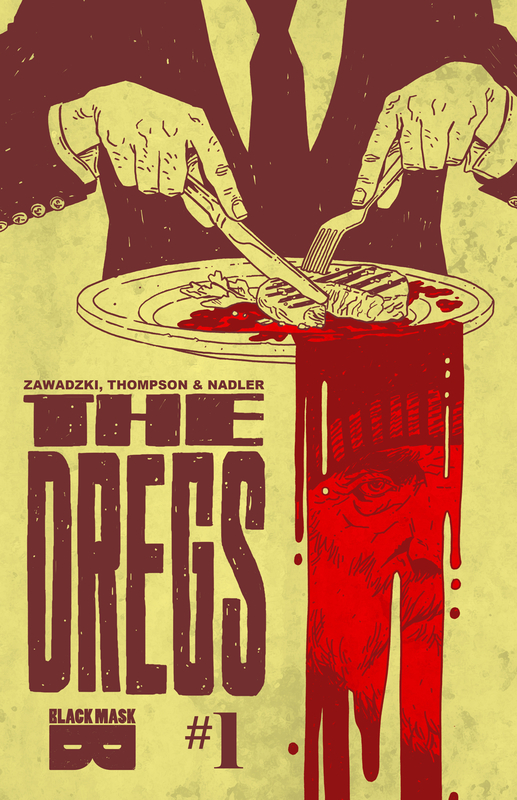 'The Dregs' is unlike any detective story you've ever read. It's not only in the spirit of hardboiled pulp novels like 'The Long Goodbye,' but offers a commentary of modern society like gentrification, drug abuse, and the plight of the homeless. Here's the solicitation that kind of gives the story away but it's so well executed that you still have to experience it. The drug-addled homeless man is Arnold and his friend has gone missing. The opening of the book makes it pretty clear that things in Vancouver's East Hastings neighborhood have gotten cutthroat. Between the homeless struggling to survive to the new developments popping up displacing them even further, Arnold has his work cut out for him as he tries to piece together what happened to his friend. Lonnie Nadler and Zac Thompson do their best to honor Raymond Chandler without falling into parody as Arnold operates as his favorite detective Philip Marlowe. He pounds the pavement looking for clues and realizes he's up against more than he bargained for. He has to battle not only whatever conspiracy that's befallen his friends but his own addiction. 'The Dregs' exposes the disposable ways that the homeless are treated, trapped between their own situation and the world that continues to encroach upon them. It's a multilayered story that elicits empathy, anxiety, and a level of real-world relatability to the series. Eric Zawadzki creates a wonderfully detailed urban center where Arnold can prowl like a panther, full of corners and alleys to navigate. The juxtaposition of the homeless detective made small by his environment and his circumstances. The layouts are creative and dynamic resulting in some of the most visually arresting pages you'll see in comics. It's all bolstered by Dee Cunniffe’s coloring. Using muted earth and rust hues, Cunniffe captures the often dirty little corners of a downtown where every dark corner can be home to someone full of belongings that may seem like trash to us. 'The Dregs' #1 is a winning debut that takes an unlikely protagonist on a mysterious journey that also reflects the ugliness in our own world. Masterfully crafted with a nod to crime noir of the past, Nadler and Thompson have created a true detective story that crackles with hard-boiled fiction and social criticism. It would be a crime to miss out on this title.